Summary: The BlackBerry PlayBook, released in 2011 to mixed reviews, should be re-evaluated. It is a stellar device with great, innovative, and improving software, now at bargain prices. It remains the only great 7″ tablet I’ve seen. Both the hardware and the underlying OS are fantastic. QNX is a bulletproof OS, the UI is intuitive and elegant. This is a great OS, well executed, on quality hardware. All that’s missing are the apps and mindshare. Note: This review is a modified version of the review that I wrote in April 2011 on the day of release of the original PlayBook. I am now on my second PlayBook. I bought a 16GB for $450 on the day it was released, and upgraded this to the 64GB version in February 2012, just before the release of RIM’s Tablet OS 2.0. The PlayBook starts off strong with very quality, understated, and completely recyclable packaging. As with the entire PlayBook experience, it is well thought out but isn’t copying anyone. In the box, you get the PlayBook itself, a cloth to clean the screen, a simple neoprene sleeve, a few short booklets, a Micro USB sync cable, and an AC adapter that is also Micro USB and charges the PlayBook quickly. So far, so good. The sleeve is a welcome and unexpected addition. This was a wise move by RIM, as it shows that they’re not trying to cut corners. That said, there are some very nice cases available for the PlayBook, including one that also serves as a stand. These accessories are expensive but knock-offs will surely follow. On first boot, the PlayBook takes a minute or two before taking you to a brief tutorial, setting up WiFi networking, and then checking for software updates. Then you get to wait for 20 minutes while it downloads and installs a 300MB update. RIM absolutely nailed the hardware. This is a 7″ tablet that exudes quality. It is very solid and feels better in the hand than an iPad/iPad2 let alone the bevy of Android tablets I’ve used. It weighs about 1 pound and exudes quality. The only niggling problem I see hardware-wise is that the power button is frustratingly difficult to push on my 16GB first-generation hardware. RIM corrected this on the 64GB version I bought in February 2012. Even so, for me, this hasn’t been a big deal. On the device, you will find a mini HDMI connector, a dock connector, Micro USB for sync and charging, the aforementioned power button, a three-way volume/play/pause button, and a headphone jack. The tablet itself features a dual-core A9 1GHz CPU with a 7″ 1024×600 IPS display. The viewing angles are great, and the PlayBook is very usable in direct sunlight. This is the nicest tablet display I’ve used. It has 1GB of RAM, and the best speakers I’ve ever heard on something this small. Seriously, they are amazing. And I’m picky. The screen is gorgeous. The sound is gorgeous. It feels good in the hand. Honestly, hardware-wise, I think RIM has a hit here. The rear-facing camera works very well in low-light. Here’s an interesting tidbit: The 7″ screen makes the viewfinder about the same size as what you’re taking a picture of. What You See Is What You Get photography! RIM, seeing that it was falling behind on the OS front, bought another quiet Canadian tech giant in 2010: QNX. QNX, makers of their Neutrino OS, is an Ottawa-based company that, in my opinion, created the most solid, coolest, and most interesting OS available. They were a long-time private company that was sold to Harmon International in 2004. Thankfully, RIM bought them back. I love operating systems. What can I say, I’m a systems guy. In my undergrad I had a single 3.5″ floppy disk with QNX OS 4 that contained an entire live operating system that would boot to a GUI with a web browser on almost any PC. Ever since then, I’ve dabbled with QNX whenever I could. They briefly toyed with the desktop in QNX 6.2.1 but eventually gave up, focusing instead on the embedded market. QNX powers traffic lights, medical equipment, power plants, devices used in space, Porches, high-end routers, and more. RIM bought quite the Canadian jewel when they picked it up. QNX has also always been relatively open, but not entirely so. All-in-all, I imagine that the company is a good corporate fit with RIM. If you’re interested in QNX, the Wikipedia entry is a fascinating read. As mentioned above, the PlayBook features RIM’s new QNX-based operating system. The solid QNX-core features an absolutely fabulous user interface up top. Everything flows quickly and fluidly. Using the OS, it behaves a bit like a well-thought-out iOS and WebOS combination. Like HP/Palm’s WebOS, this is a properly multitasking operating system. Running many apps with many browser tabs open at the same time, I have yet to see any significant slowdown. The PlayBook is very efficient, and bundled applications work very well. It is fast, fast, fast. In addition to a fantastic WebKit-based browser, the BlackBerry PlayBook ships with a capable and attractive music program, a great calculator, Kobo Books, a working music store (a rarity in Canada) with a good selection of jazz, a podcast app that found CBC Spark and TVO’s Search Engine and allows you to add your own, a good PDF reader, and a smattering of other useful programs. [Word|Sheet|Slideshow] To Go are preloaded and work well, allowing for the creation of MS Office documents. There are also links to Gmail, Hotmail, Yahoo Mail etc. 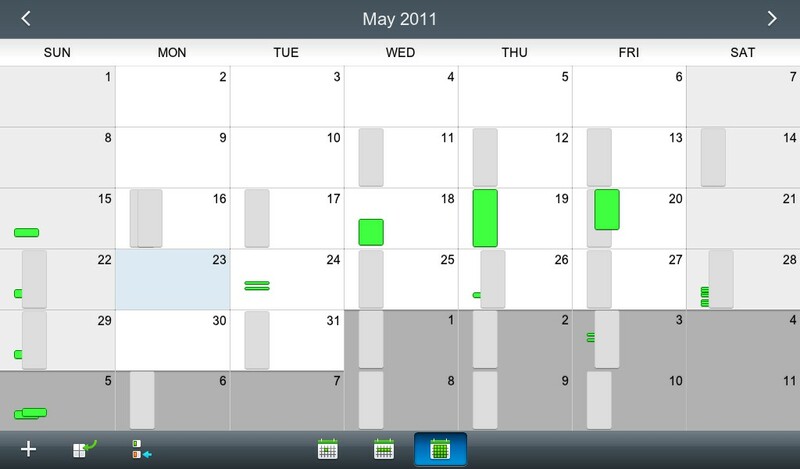 With the release of Tablet OS 2.0, RIM has also finally added native Email, Calendar, Contacts, and Tasks. This omission in the original release was largely the reason for the initial negative reviews. Many people feel that RIM took too long to fill this gap, but they have many priorities they are juggling at the moment. They have now addressed this problem in a major way, releasing beautiful, elegant, and innovative native apps. However, it’s worth noting that these “missing apps” were only missing if you weren’t using a BlackBerry phone. Since day one, RIM shipped with the innovative BlackBerry Bridge, which was good enough to move me kicking and screaming back to BlackBerry phones. Bridge gets its own section below. The PlayBook runs a completely new OS, with completely different apps. It is a complete departure from the typical BlackBerry OS. It doesn’t use Java, and can’t run existing BlackBerry apps. The PlayBook ships with some great and unexpected programs, like the NFB program and the excellent RSS reader BlackBerry News. The lack of PIM and mail apps as well as the initially barren App World meant that the PlayBook couldn’t do much other than browsing, reading PDFs, reading books from Kobo, or listening to music on launch. It did excel at these tasks, but this wasn’t enough on release. However, since April 2011, the situation has improved and is poised to do so again with Android compatibility in OS 2.0. Now, there are several reasonable IM apps, many games, including hits such as Plants vs Zombies, Angry Birds, Cut The Rope, and most of Game Loft and EAs other games. I also regularly use several SSH clients, this WordPress app, a great ePub reader, and more. Android apps are just starting to hit App World. Kindle and Dropbox apps are reported to work but are not yet easily available. The app situation still leaves much to be desired compared to iOS or Android, but it has improved considerably over the last several months, and seems to be doing so at an increasing pace. RIM knows that the Android compatibility layer is a double-edged sword: True, it gets them access to thousands of apps for “free” but it discourages developers from creating beautiful native apps. I haven’t seen elegant Android apps. Functional, yes, but not elegant. Still, RIM hasn’t been sitting still with respect to developer tools. On launch, you had to write using Adobe AIR (Basically Flash.) The tools also originally only ran on Windows. Now, RIM has released the HTML5-based WebWorks as an open source project, as well as the C++-based NDK that runs on Mac and Windows. This is still a young platform but it is improving quickly, both for end-users and developers. Still, if you want a completely functional tablet today with access to millions of apps, stick with an iPad. If what you need is covered by what is available now, I think the PlayBook is the best 7″ tablet available. Back to a more positive note: the PlayBook has some unexpected and thoughtful extras. For starters, you can pair both a Bluetooth keyboard and mouse. Moving the mouse, you are presented with a traditional cursor on the screen. At the moment, this is of limited usefulness, though it should make browsing and Flash a more laptop-like experience. The mouse cursor may be passe, but there are good reasons that mouse and keyboard have been the dominant interface devices for the last several decades. RIM has clearly avoided throwing the baby out with the bathwater here. Sure, they may hide the ability to use a mouse, but they don’t stop you. One can easily envision remote desktop apps and many traditional programs translating better to the PlayBook than to other tablet operating systems. In fact, this is no-doubt incredibly valuable for the Remote Desktop apps now available in the App World. 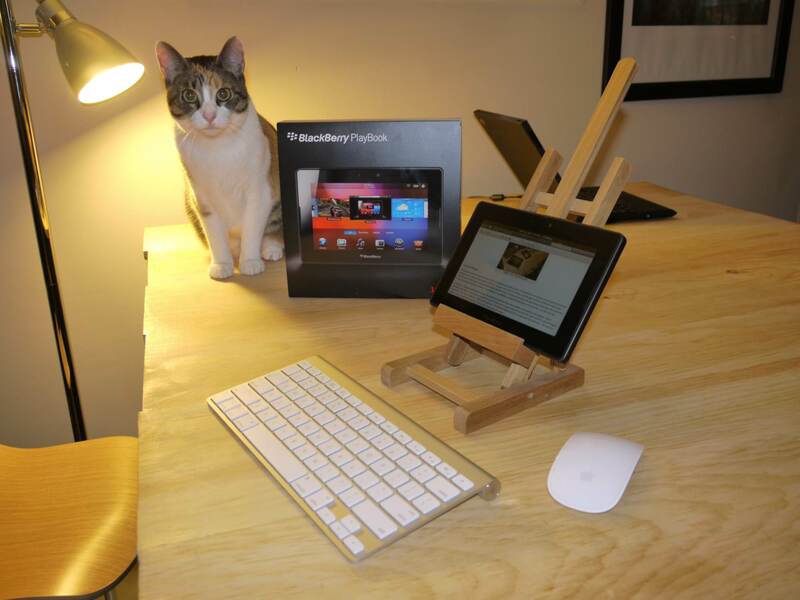 BlackBerry Bridge was RIM’s original answer to the lack of native mail and PIM apps on the PlayBook. While these shortcomings have been addressed in Tablet OS 2.0, I still think that for any BlackBerry users, Bridge is a better approach. In fact, I would guess that if more reviewers had been BlackBerry owners, initial reviews of the PlayBook would have been far more positive. 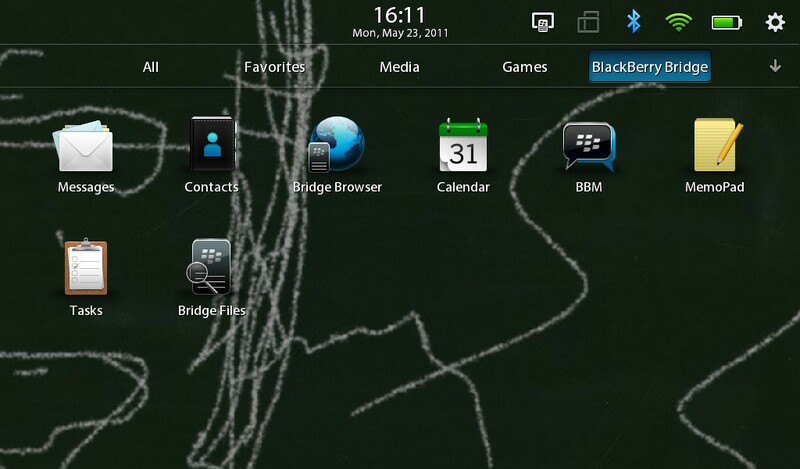 In fact, the execution of Bridge is quite an elegant alternative to built-in native PIM and mail apps. While Bridge limits access by design, it very handily sidesteps a slew of potential security concerns and truly turns the PlayBook into a dual-function work and play device. 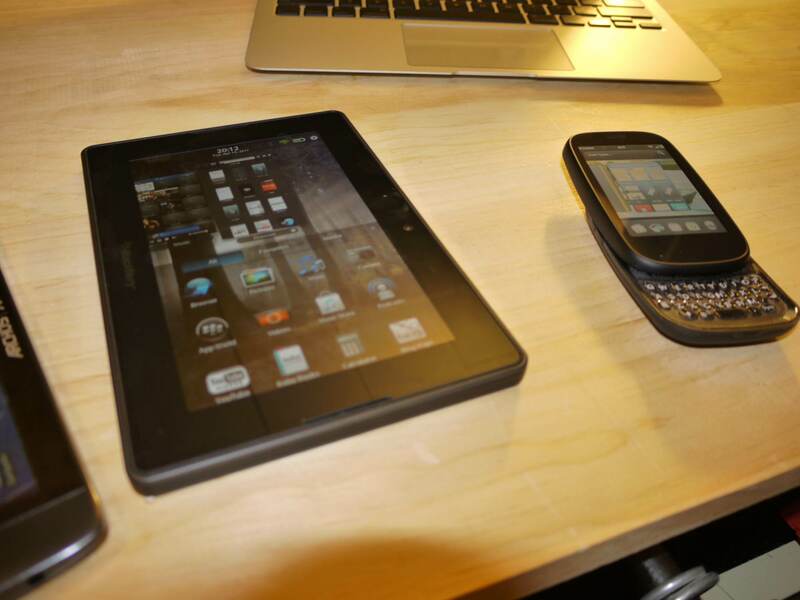 One difficult decision that I’ve had to make with other tablets was whether or not to configure the devices as fully-connected and integrated parts of my digital life. By this, I mean whether or not to sync the calendar, contacts, and mail to my usual accounts. Doing so is handy, I can look up an address or quickly check/edit my calendar, but it also means that I’ve had alarms in the bedroom at midnight for all-day events, and that I have to take care to lock the devices behind a PIN or password. Because of this, I have ended out removing mail and disabling my calendar and contacts accounts on some devices. With Bridge, I don’t need to make this call. If the tablet is close to my phone, I get access to PIM and mail over Bluetooth. If the phone is off or away, I don’t have to worry about the distractions of work. Honestly, I vastly prefer this to the normal Android tablet approach. Not only that, I don’t need to worry about setting anything other than Bridge up. No per-device mail, calendar, and contact setup. If I lend the PlayBook to a neighbour or friend, I don’t have to worry about wiping th device first, and at 11 when my phone powers off, I know there will be no alerts or distractions to bug me. It’s actually quite liberating. As a constant user of Bridge, I’m convinced that RIM is on to something here. 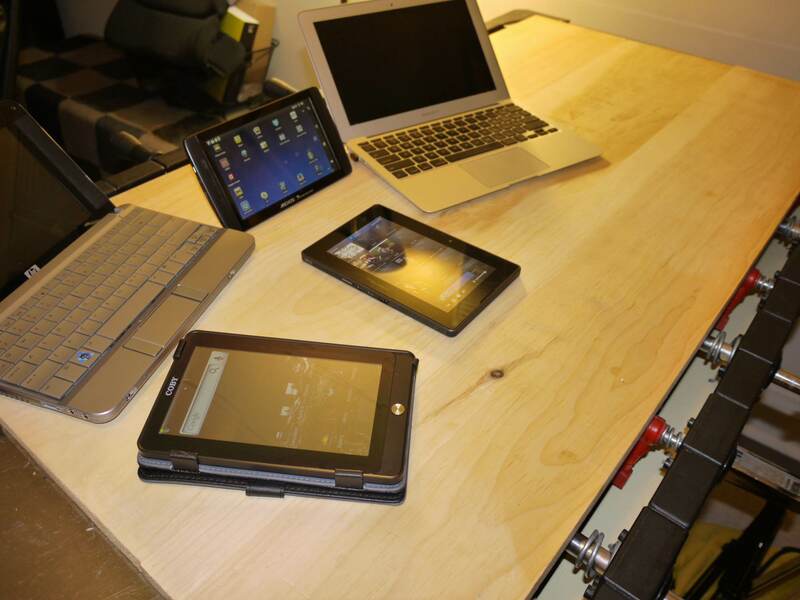 Security of these tablet devices is a big unanswered question. They typically aren’t as close to you as cell phones, and locking them down as one might a laptop limits their usefulness. As a result, the potential for data loss is huge. RIM largely sidesteps these problems with Bridge. I’ve long wondered if perhaps instead of creating native PIM and email apps for the PlayBook, RIM should have focused on bringing Bridge capabilities to iOS and Android, which would solidly position the PlayBook as a compliment to a smartphone. I think that RIM’s approach with Bridge has been a real missed-opportunity. Rather than trying to duck the missing native apps, I think they should have talked up Bridge and touted the behaviour as an advantage of the platform. Perhaps they should have even provided reviewers with BlackBerry phones with canned dummy content to show them how well it works. As with the iPod/Mac halo-effect, this may gently prod potential users to the BlackBerry family of products, while keeping the BlackBerry smartphone as the centre of the attention. Unlike the iPad, the PlayBook does not require a PC. Nor does it require iTines or equivalent management software. When you plug the PlayBook in to MacOS or Windows, you are prompted to install drivers and reboot. After this, the device mounts when you plug it in. It’s actually doing some sort of network connection with automated mounting (using Samba or something similar, I suspect.) I’m not exactly sure what’s going on here yet, but it works well. You are presented with a subset of folders for dropping files. This is how I loaded up my PlayBook with music, video, and documents for testing. It’s not quite as straightforward as a USB mass storage device, but it’s pretty good. Another helpful option is to use the integrated wifi sharing. It uses Samba or something similar to share files over CIFS/SMB. I have used this successfully from Mac, Linux, and Windows. All that’s missing is an sshd! BlueBox, a Dropbox client, exists, and the Android Dropbox client works well but isn’t yet available in the App World. BlueBox is OK but I hope to see the Android client widely available soon, as it is better. I must say, a well-integrated Dropbox client is my preferred way to keep files in sync these days. After using the PlayBook since April, I find that I use it more and more over time. In fact, of the tablets for sale today, it’s my favourite. I feel that it has the best web browser out there, Bridge is an innovative approach to PIM functionality that I actually prefer to the wonderful built-in apps now availible in Tablet OS 2.0. The release in 2011 was surely botched, but this is still an excellent device that clearly shows the way forward for RIM. The hardware is great, the core OS is great, the user experience is great, the bundled apps work well and achieve a level of elegance I’ve only seen on iOS. The OS incorporates the best of iOS and WebOS in a very pleasing, elegant, fast package that remains distinctly BlackBerry. If you’d like to tinker with QNX or are a developer, the PlayBook is very attractive, as it allows you to write in C++, AIR, Java (Android) or with HTML5 in WebWorks. PlayBooks originally started at $500. These days, the 16GB version is priced normally at $200, my 64GB was $299CDN. 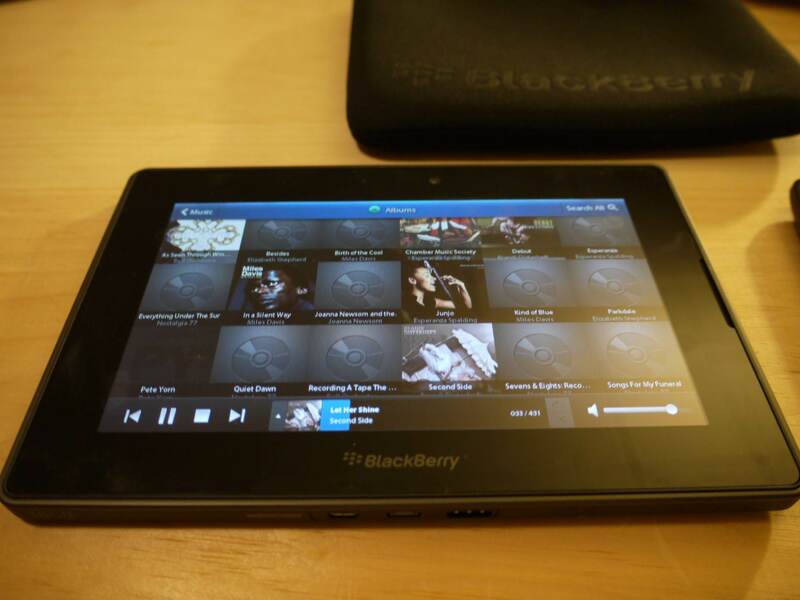 Now that RIM as sorted out the core functionality and the apps are beginning to flow, the BlackBerry PlayBook is a great device that is easy to recommend. Given all that they have accomplished in this release. I think they have done an outstanding job. Congratulations, RIM. Now, get back to work on BlackBerry OS 10! It’s a little small for some tasks. It would be nice to see both a 7 and 10″ model. No 3G version, though there is no need for this if you have Bridge and a BlackBerry phone. The best BlackBerry PlayBook case doesn’t work with the charging dock. thank you for this good review. I did buy a 16 GB after christmas, but returned it because I found that there was a lack of apps available. I bought also a Lenovo, a transformer prime and I returned those two also. I was tabletless. When I read that the 0S 2.0 of the playbook was to be released soon, I decided to get a 64 GB, and I’m very happy with it. It’s true that there is not a lot of apps like iOS and Android, but it will come, and I hope that there will be a good evaluation to avoid all the scrap available. Thanks for the great review! I’ve just ordered a 16GB PB and can’t wait for it to get here. I like the stand in your picture–where did you get it? Thanks for the interest. The stand is actually a very small easel that I picked up at a local art supply store, Wallack’s. I also use small plate stands or picture frames available at Michael’s for well under $10.